Everyone Was Surprised! Man Dressed In Shabby Clothes Buys Harley Davidson In Cash! - Muscle Cars Zone! Everyone Was Surprised! 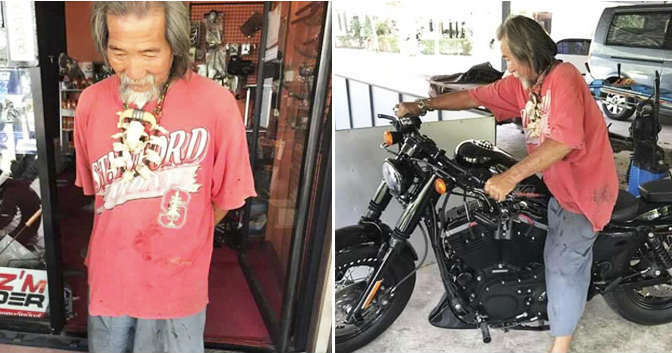 Man Dressed In Shabby Clothes Buys Harley Davidson In Cash! When an old guy wearing an old, oversized t-shirt and torn baggy pants walks into your store, you don`t automatically assume this guy in shabby clothes is going to buy an expensive new motorbike. 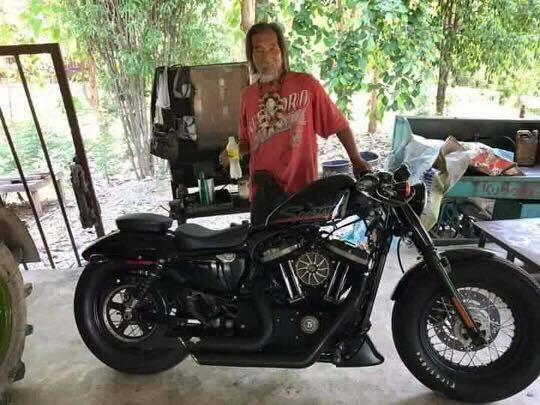 That`s why this Thai man was rejected service in a number of shops but as soon as one of the shops actually gave him the needed attention, he got to liking one of their Harleys and whipped out almost 18 thousand dollars and bought it on the spot, in cash. How`s that for changing the primary impression? I bet those shopkeepers weren`t expecting that! The man, Lung Decha had been a hard-working mechanic all his life so after partially retiring he decided to give himself the bike of his dreams. This story was published by Lung`s older sister and it`s truly heartbreaking to see – if you`re dressed in shabby clothes and you don`t look rich, modesty is immediately sidestepped and people assume you`re below their standard. This guy sure proved them all wrong though and they`ve definitely changed their minds! For Thailand, 600 000 baht is a lot of money and nobody could have guessed he was lugging all that around in his old and torn baggy pants. Finally, see the top 10 Harley Davidson motorbikes of all time.